This is an Example to Make 3 Different Type of Pie Chart in React Native. React Native Pie Chart can be made using the library react-native-pie. If you are making an app which has numbers and lots of statics to show then charts are the best way to show that data. Pie Charts are best to use when you are trying to compare different parts of a whole. They do not show changes over time. 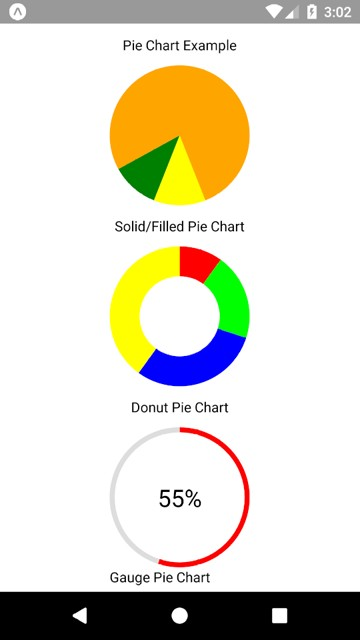 Here is the Example to make Pie Chart in your React Native App. 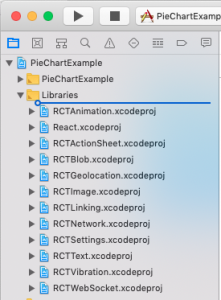 To make a Pie Chart we are going to use a react-native-pie library. It will provide a Pie component which is very easy to integrate. You can see the example below. In this example, We are going to make a Solid/Filled Pie Chart, Donut Pie Chart, and Gauge Pie Chart. So let’s get started. 1. 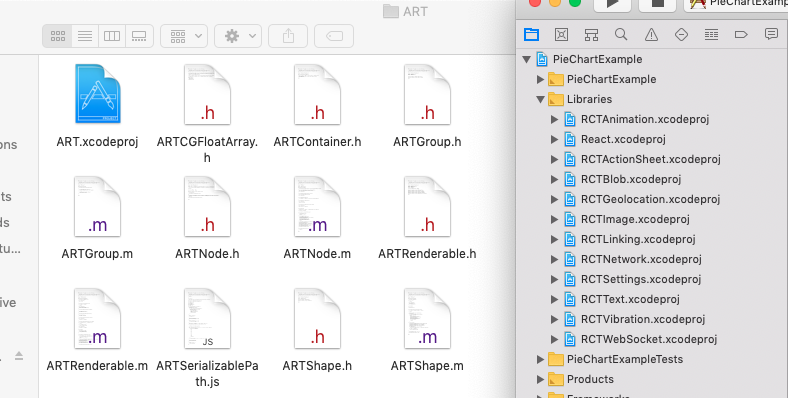 To use Pie component, you need to install react-native-pie package. This command will copy all the dependencies into your node_module directory, You can find the directory in node_module the directory named react-native-pie. 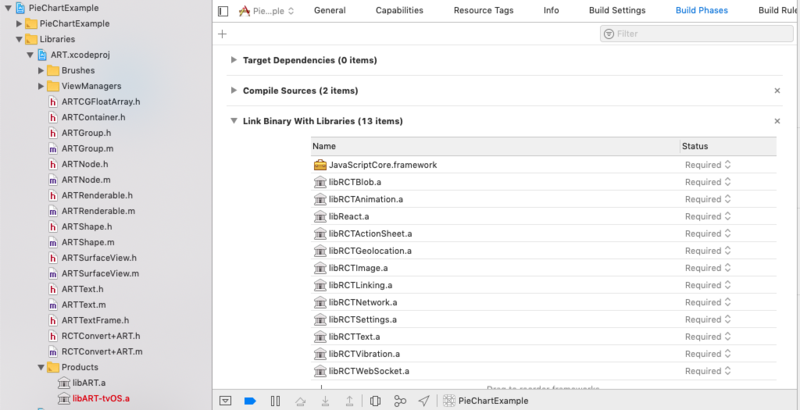 You will see Project Structure in Left Menu. Click on the Libraries option to expand. 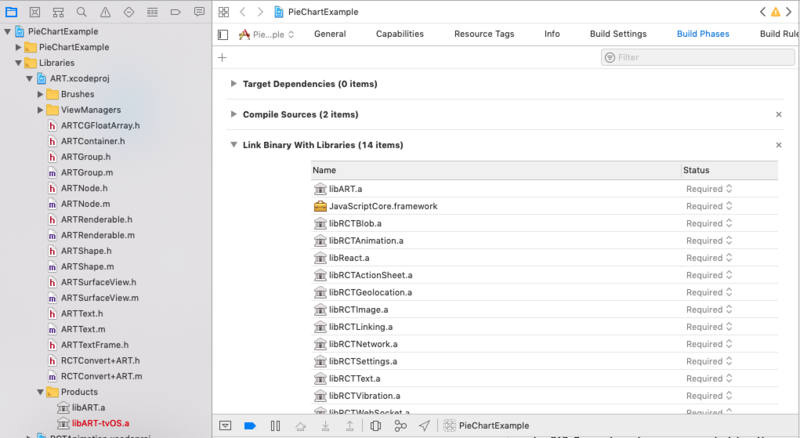 Now drag the libART.a file into the Link Binary With Libraries. That’s it! Now we are ready to proceed for the next step. That was the React Native Pie Chart. If you have any doubt or you want to share something about the topic you can comment below or contact us here. There will be more posts coming soon. Stay tuned!